Dinarobin Villas’ picture-perfect setting, luxurious amenities and beautifully appointed living spaces earns it a top spot on any Mauritius vacationer’s accommodation list. 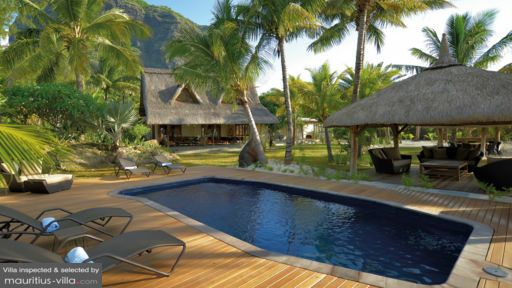 The exclusive resort, comprising three villa properties is set along the spectacular white sand coast of the Le Morne peninsula - placing you just a skip away from the pristine shores and sparkling ocean waters. What more can a beach lover ask for? Each of the three villas contain four bedrooms. The master bedroom features a double bed and private en suite. Both guest bedrooms are equipped with double or twin beds, while the fourth room is a kids room with two single beds. 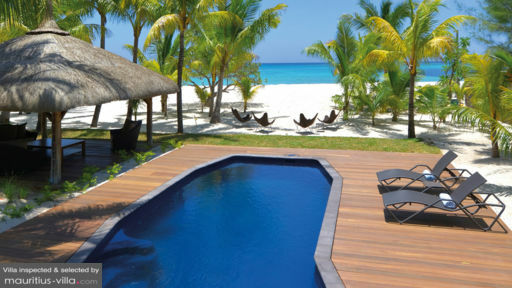 Enjoy views out to the azure ocean and white sand coast from the sun-soaked garden of your villa. Dotted with emerald foliage and swaying palms, each property boasts amenities like gazebos, outdoor bar and barbecue area, a heated pool with jacuzzi and outdoor showers. The gardens extend out towards a 70-metre stretch of private beachfront, so you’re just steps away from the island’s paradisiacal shores! With a private butler and personal chef, you won’t have to lift a single finger during your stay at Dinarobin Villas, leaving you with plenty of time to enjoy the full range of luxuries that the complex offers. If you’re in the mood for nestling indoors, the cosy living spaces are outfitted with TVs with DVD sets and iPod docks to keep you well entertained. When it comes to dining, choose between enjoying a barbecue party at your villa, or trying out one of the four on-site restaurants dishing out French, Italian and Mauritian fusion cuisines. 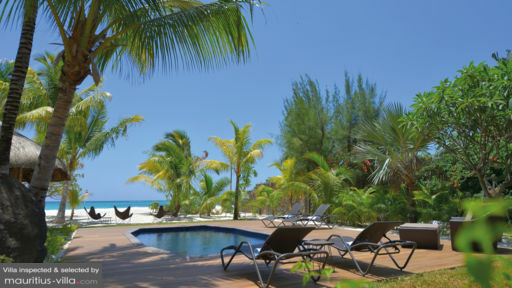 You’ll also have access to high-end dining venues at the neighbouring Paradis Hotel & Golf Club. Your tropical vacation won’t be complete without plenty of downtime and relaxation. We recommend trying out the on-site Dinarobin Spa by Clarins, or working up a sweat at the golf course, fully equipped gym or tennis court. Kitesurfing, stand-up paddle board and beach yoga sessions are available at additional cost. Get ready for a holiday filled with plenty of adventure! There’s much to see and do around Dinarobin Villas - from spending a leisurely day at the Le Morne beach, to playing at the Paradis Hotel Golf Club, taking a helicopter tour of the island or kitesurfing. Notable attractions nearby include the Chamarel Waterfall and Frederica Nature Reserve.